Only an individual suffering from the problem of sweaty hands knows how frustrating the problem is. Warm hands are always a sign of positiveness and when you shake hands, the other person feels welcomed. In contrast to that, if your hands and feets are sweaty, it is disgusting for you as well as for the person with whom you are shaking hands. Sweaty hands can actually put you into huge embarrassment in front of others. Apart from the embarrassment factor, having sweaty hands and palms can cause a lot of problems in your day to day work as well. I have been a victim of sweaty hands and at times I was not even able to write anything continuously due to continuous sweating. But did you know that there are home remedies to stop sweaty hands? Well if you are tired of sweaty hands and feets and wondering about how to get rid of it, then here’s the post worth checking. Today I am sharing a few of the best home remedies to stop sweaty hands and feets naturally. If you have sweaty hands, you literally have to wash and dry your hands before most of the activities (as we involve our hands in most of the works we do) and that is not so cool. In addition, the constant wet feeling of your hands is damn irritating and can also lead to stinky smell in your palm which is even more disgusting. And, the saddest part is that we have no control over it and the cause of sweaty hands and palm does not lie in our hands. However, the good part is that there are remedies for it as well and today I will be talking about 14 of those exceptionally best home remedies to stop sweaty hands. If you are pissed off with sweaty hands and wondering how to get it right, then check these home remedies, and apply these to cure sweaty hands easily and naturally. Sweaty hands can be very irritating and it must be dealt with as early as possible. But do you know what exactly leads to this problem? See, not everyone faces this issue, so there are definitely some factors that lead to sweaty hands. So, let me tell you a bit about the main causes of sweaty hands as that will help you in getting rid of the problem from its root. Well, one of the major and the most common cause of sweaty hands is excessive stress. Most people experience their hands sweating a lot when they are under stressful circumstances which are making them very anxious and nervous. These feelings of stress, anxiety, and nervousness are the main culprits behind sweaty hands as they stimulate a fight or flight response in our system, which further leads to the release of the stress hormones cortisol and epinephrine in our body. Now, the hormones do try to cope with whatever is making you panic but side by side, they also raise your body temperature and heat. In such a situation, your body has to regulate the temperature and so the sweat glands are activated and the extra heat is released in the means of sweat. Unfortunately, your hands do not get a pass on this cooling mechanism which is why you face the problem of sweaty hands. The other possible reason behind sweaty hands probably lies in your genes. In many cases, it is seen that the excessive sweating of hands occurs in individuals who has a family member with the exact problem. But, this problem often skips generations, so it is possible for you to inherit it even though your parents do not have the sweaty hands. In most cases, sweating of the hands is considered normal but if your hands are sweating in excessive proportions and that also for no reason, then it is known as palmer hyperhidrosis. It is actually described as a situation where there is uncontrollable sweating of the hands. So, if none of the natural solutions are working in your case, then maybe you need to consult a good dermatologist for immediate attention. Well, fortunately, I have benefitted from the remedies I am sharing here and so have my friends. Majority of the individuals are able to get rid of sweaty hands problem with these remedies to stop sweaty hands. So if you are suffering from sweaty hands condition, then it is important for you to know about these remedies and then apply it to cure this disorder. So, without delaying any further, let us check the remedies. There are remedies for almost every problem that an individual face and thankfully, the problem of sweaty hands is no exception. And, today, we will learn about some of the natural ways to cure sweaty hands. 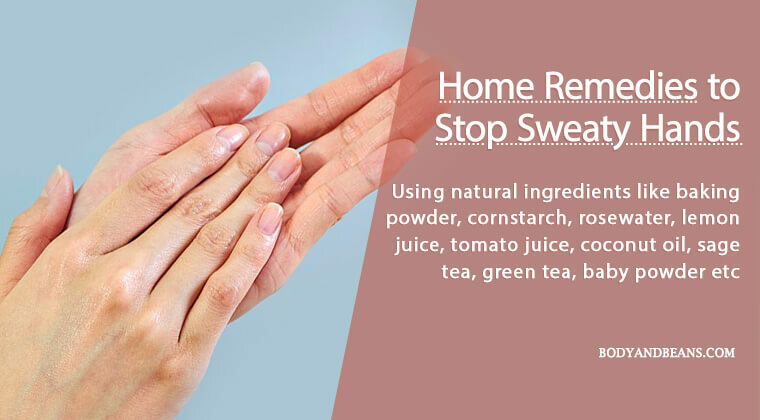 If implemented right, these natural home remedies to stop sweaty hand will give you satisfactory results. 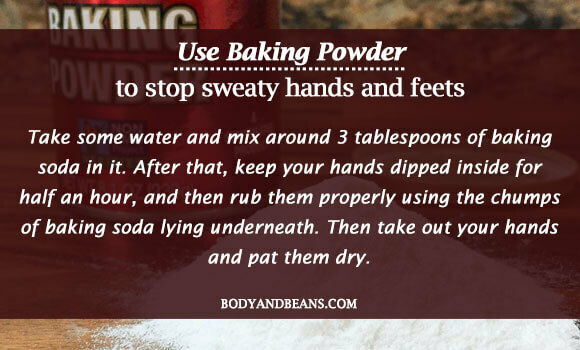 Baking soda is alkaline in nature, which makes it one of the best home remedies to stop sweaty hands. It will absorb all the moisture from your hands and leave them completely dry. So, you must definitely consider it as a good option and give it a try to treat sweaty hands. All you need to do here is to take some water and mix around 3 tablespoons of baking soda in it. After that, keep your hands dipped inside for half an hour, and then rub them properly using the chumps of baking soda lying underneath. Then take out your hands and pat them dry. This is a great solution to the excess sweat and you can use this in case of your sweaty feet as well. 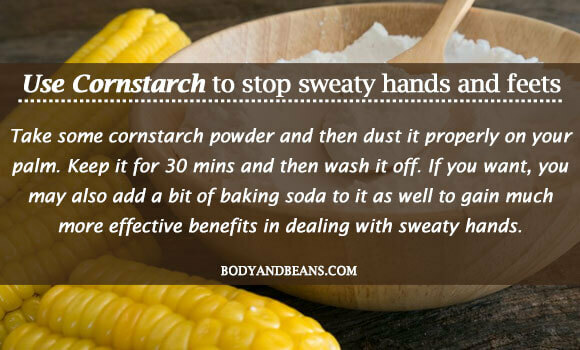 Quite similar to the baby powder or talcum powder, cornstarch has the potential to instantly make your hands dry. There will be absolutely no extra moisture on your palms and it will also inhibit your hands from getting sweaty for a long time. You need to arrange for some cornstarch powder and then dust it properly on your palm. Keep it for 30 minutes and then wash it off. If you want, you may also add a bit of baking soda to it as well to gain much more effective benefits in dealing with sweaty hands. To get the maximum benefits in curing sweaty hands with rosewater, you need to at first take some fresh rose petals and then boil them in water for about 15-20 minutes. After that, strain the mixture and store the rosewater in some airtight container. Then use a cotton ball to apply the water on your hands. Let it stay and dry naturally. 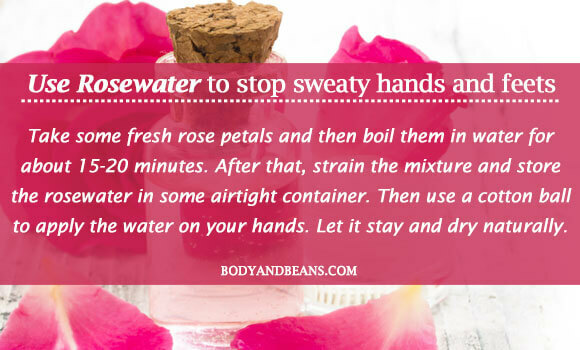 You may also mix the rosewater with vinegar before applying it on your hands as well as this will make your hands even drier. Lemon juice remedy is one of the other effective home remedies to stop sweaty hands naturally and each one of you can give it a try. Lemon juice will remove the moisture and keep your palms dry for a long time. Additionally, the sweet-sour fragrance will serve as a natural deodorant for you as well and remove sweat stink if any. There are many ways to use lemon juice to cure sweaty hands. The first and easiest way to use lemon juice is to take a lemon and squeeze the juice out of it using a grinder. Then you can mix a bit of vodka to it. Rub the mixture on your palms and remove it after 15-20 minutes to get rid of sweaty hands. Alternatively, you may mix a little amount of salt along with the lemon juice and rub the mixture on your hands. This will not just make your hands dry but will slowly reduce the activity of your sweat glands as well. However, remember to add a little bit of water in the lemon juice remedies in case you have a very sensitive skin. You may try out the juice of the tomato as it is the perfect coolant for your body and it helps reduce sweating. It will lower the temperature of your body and will give you a cooling feel. Moreover, the high sodium content in tomatoes will also help you in keeping your hands dry. The procedure to use tomato for sweaty hands is very simple. You need to take a big tomato and grate it or grind it to get the juice. Now, you need to dip your palms in it for some time like 15-20 minutes. Slowly, you will notice the difference in sweaty hands condition. 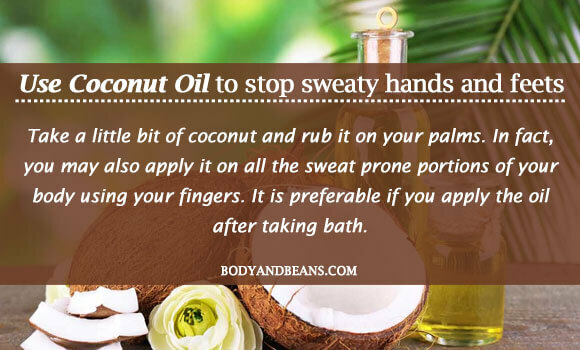 Coconut oil remedy is one of the best home remedies to stop sweaty hands and this solution can be applied on most skin types, because the coconut oil is considered to be very skin friendly. It is a good antiperspirant which helps you serve your purpose. Besides, the lauric acid in it kills the bacteria and helps you get rid of the unwanted body smell. In fact, coconut oil has got a very soothing fragrance of its own which gives a refreshing feel all day long. Here, you need to take a little bit of coconut and rub it on your palms. In fact, you may also apply it on all the sweat prone portions of your body using your fingers. It is preferable if you apply the oil after taking bath. However, avoid over-applying it as that may stain your clothes. Sage is Mother Nature’s antiperspirant. It has a natural astringent tannic acid present in it which helps to constrict and shrink your skin and the skin pores. So, this shrink actually helps to reduce the occurrence of sweat. To get the maximum benefits in sweaty hands issue, you have to take a quart of boiling water and add about 4-5 sage tea bags in it. Steep the tea until it gets cooled enough to be touched. 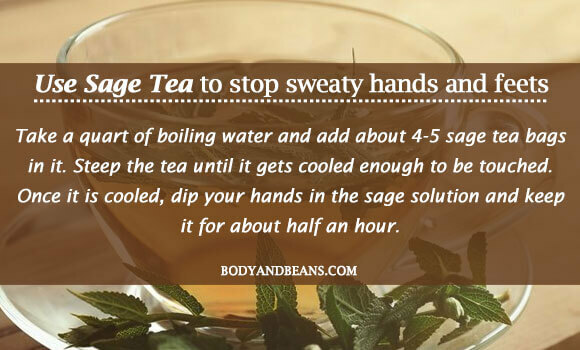 Once it is cooled, dip your hands in the sage solution and keep it for about half an hour. You will experience the results shortly. The craze of the green tea among the younger generation is because it helps you lose weight. But do you know that green tea is also a solution for sweaty hands issue? Well, drinking green tea helps to close the skin pores naturally which in turn, seals the sweat in. It also benefits in the removal of the excess moisture and oil from the surface of your skin. In addition, it also aids you to eliminate the body odor which often occurs due to too much accumulation of sweat. 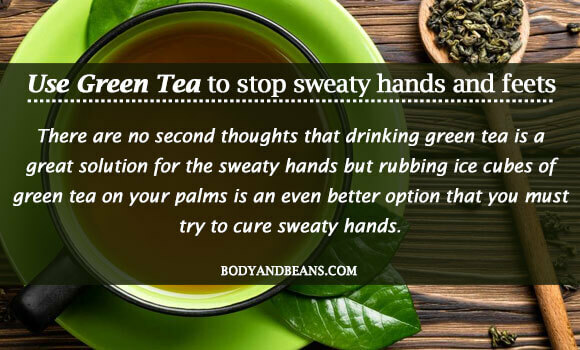 There are no second thoughts that drinking green tea is a great solution for the sweaty hands but rubbing ice cubes of green tea on your palms is an even better option that you must try to cure sweaty hands. I am sure that you won’t be disappointed after trying this remedy. In case you are not that much comfortable putting baking soda in your hands, you may go for the skin friendly baby powders or any good talcum powder which may be readily available in your home. To cure sweaty hands with baby powder, you just have to sprinkle some baby powder and rub it properly on your palm. This will remove all of the moisture and make your palms dry. Also, it will give you a good grip when you will be performing activities, which otherwise becomes difficult with sweaty hands. The only problem with this remedy is that your hands will get a bit too white but considering the benefits it gives you, I think that thing can be easily ignored. After all, you will be putting powder on your palms when you are at home, so it won’t be much of a problem. 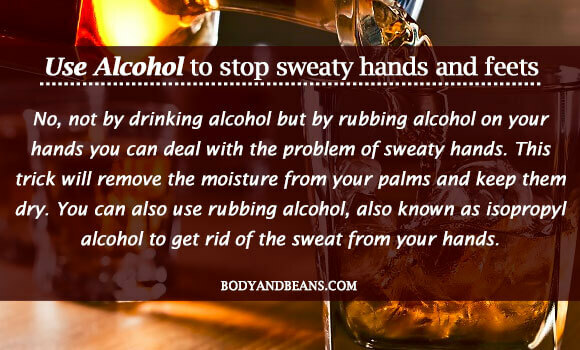 No, not by drinking alcohol but by rubbing alcohol on your hands you can deal with the problem of sweaty hands. This trick will remove the moisture from your palms and keep them dry. You can also use rubbing alcohol, also known as isopropyl alcohol to get rid of the sweat from your hands. I will also suggest you to keep alcohol-based hand wipes in your pocket all the time as those will come handy at important and emergency circumstances. Apart from the home remedies to stop sweaty hands that we have discussed above, there are some very useful tips to cure sweaty hands that I am sharing below. These tips to cure sweaty hands will be of great use apart from trying the remedies mentioned above. One of the easiest home remedies to stop sweaty hands is by drinking lots of water. This is because drinking cold water keeps your body temperature cool and does not let you sweat too much. Well, most of the time we are advised to drink plenty of water especially in the summer months as water gets lost from our body in warmer climate in the means of sweat which leads to dehydration and other health complication. But, for those who have the issue of sweaty hands, it is like an all year solution. You must keep a track of how much water you are drinking all day and improve your water intake as much as possible. There is no doubt about the fact that foods we eat have a direct impact on our bodily functioning and so maintaining a proper healthy diet can be of great help in curing sweaty hands. It is a common fact that few food items contain a lot of spices or fats that can automatically raise the temperature of your body which in turn makes you sweat a lot. A poor diet also leads to lot of imbalance – mental, emotional and physical which makes you too much stressed out or anxious leading to excessive sweaty hands. On the other hand, there are foods that help in keeping your system cool and you must add these to your diet. You may be wondering that regular exercise is beneficial for general wellbeing but why it is specifically considered to be the best to deal with sweaty hand issue? Well, let me tell you that exercising is a great way to deal with stress, anxiety and frustration which helps in keeping the temperature of your body at normal level. Which in turns leads to less sweating and when you sweat less, automatically, your hands will remain dry instead of being sweaty all the time. Regular exercise will be good for you, even if you spend just 30 minutes in the gym for 5 days a week, it will help you remain fit and deal with sweaty hands issue. This will also keep you strong and fit. However, if you do not like hitting the gym, then at least take a walk every morning and engage yourself in other stress-relieving activities to cure sweaty hands. Try to keep antiperspirants with you all the time as these will come handy in emergency situations and will save you from embarrassment. The antiperspirants plug up and shrink your sweat pores which leads to less sweating whenever you apply them. Moreover, the antiperspirants are easily accessible and are also very affordable, so it can be used in worse cases. Due to the hectic and competitive lifestyle, most individuals are under immense pressure and are losing the peace of their mind. In other words, people today have to go through stressful situations quite often, be it physical or mental. These situations make an individual very pissed off, frustrated, tensed or anxious which obviously has its physical reactions. One such obvious reaction is the increase in the body temperature and heat which is released in the means of sweat. Now, apart from the other body parts, many individuals experience a lot of perspiration in their hands and feet which gives birth to the problem of sweaty hands or feet. A person having such a problem faces several awkward situations be it in his/her personal life or in the professional world. This is a frustrating problem and must be dealt with as early as possible. There are medical solutions or the Botox injections or other surgeries, that may be useful and they cannot be afforded by all. But, luckily, there are natural ways to deal with the problem of sweaty hands and so, today, I have discussed about 14 of the most efficient home remedies to stop sweaty hands easily and naturally. These remedies and tricks are safe and I am sure if implemented properly, it will not disappoint you. The home remedies involve ingredients that are easily available in market and many a times you have them in your kitchen. However, besides the usage of the natural ingredients, you also need to maintain certain discipline in life. 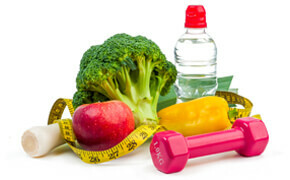 This starts with having a healthy diet, drinking lots of water, exercising regularly etc. as these also contribute to good health and helps you get rid of the problem of sweaty hands naturally. So, there are enough options for you to try and get rid of the sweaty hands issue. Now, it is your call regarding which natural ingredient you want to try out to deal with the sweaty hands. You may even try out all of them and find the best suited remedy and then stick to that eventually. But, whatever it is, do everything with a lot of patience and dedication. After all, you are the one who is going to be benefitted, so a little effort on your part is worth it. I sincerely hope that these home remedies to stop sweaty hands will work in your case. So, try them out and share the feedbacks, suggestions in the comments section. If you know of any other natural way to deal with the sweaty hands problem, then also feel free to share with us. And, if you like the post, please show your support by liking, commenting and sharing the post with others. Until then, stay happy and stay healthy.